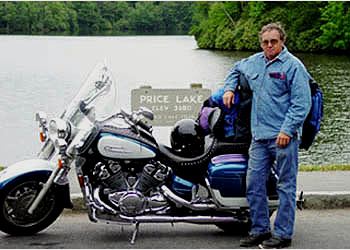 Glenn Fitzgerald, Covington GA, says, "Bike is '96 model RSTC. Bags are Champion, lid rails are Ace Tourer, Corbin seat, V&H pipes, Baron's tach, clock & temp gage by Formotion, Bigfoot, d3k, V-max diff, Rivco airhorns, relo of tank emblem. I painted the fins. Mileage is over 109,000 since June 97." Glenn is the record-holder for Royal miles unless somebody says different."